Our Google Integration aims to provide benefits to both Google account and Google Apps account users. You would either have a Google account or a Google Apps Account or both. Learn more about the differences between Google Account and Google Apps Account here. 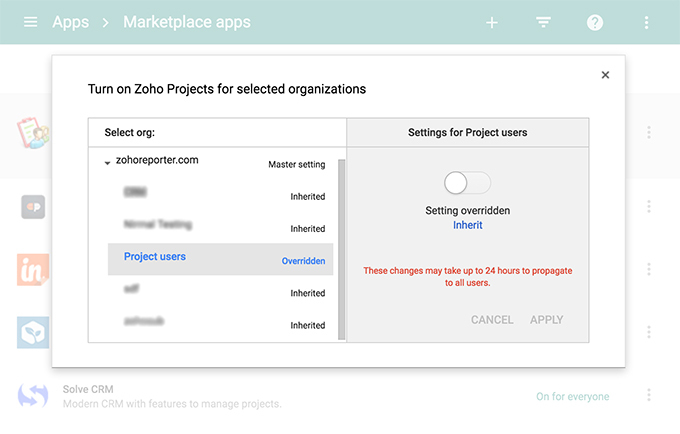 For both the Google Account users and Google Apps Account users, Zoho Projects has a set of features that help you integrate data between Google and Zoho Projects. With the combined benefits of Zoho Projects and Google applications, you can effectively collaborate, and communicate. Login to your Google Apps account. Click Settings, and then choose Manage this Domain. In Admin Console, choose Apps. In Apps, choose Marketplace apps. Click the Plus icon (Add Marketplace apps) at the top right corner. 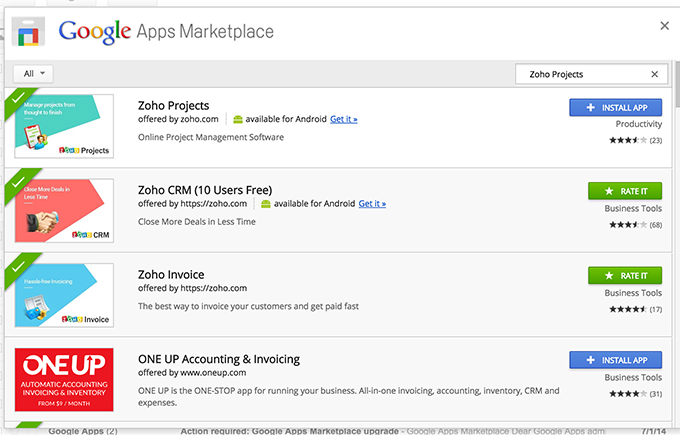 In Google Apps Marketplace, search and select Zoho Projects, and then click INSTALL APP. 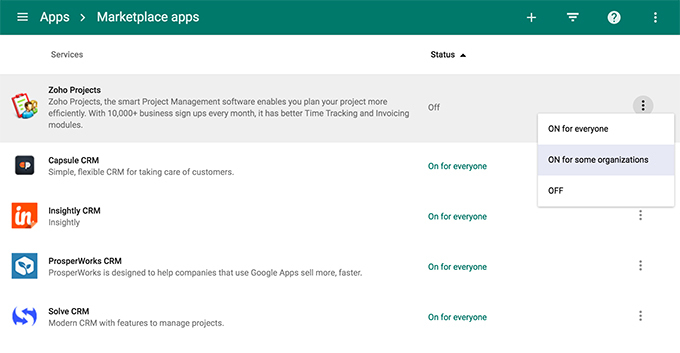 After integrating your Google Apps account with Zoho Projects, you can access your projects account from Google Apps. 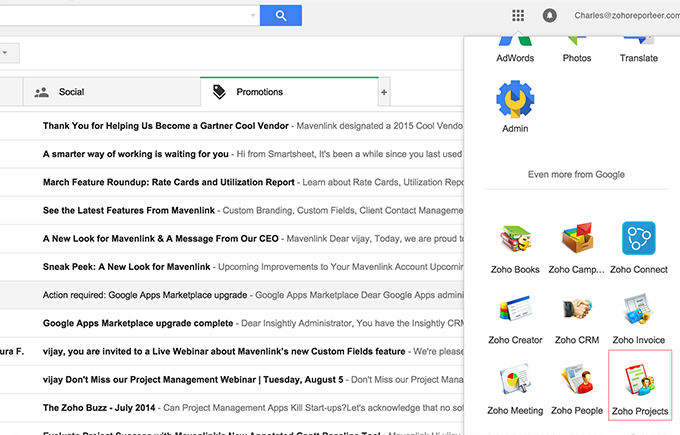 From you Google Apps account, click Google Apps at the top right corner, and then click More to access Zoho Projects. Create a Sub Organization and move users for whom contextual gadgets need to be enabled. Click here for more information on how to add a sub organization. 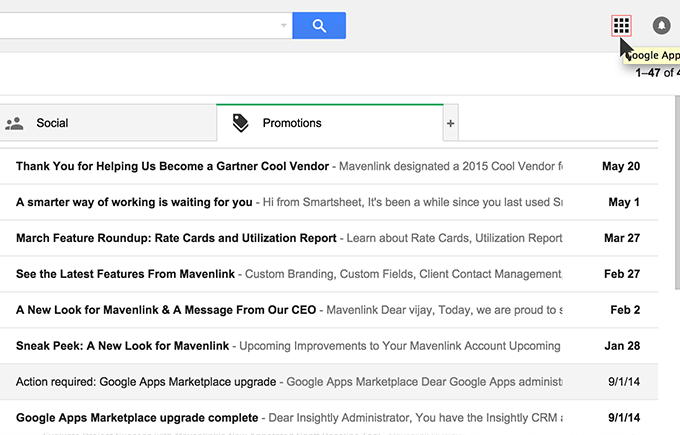 Navigate to Apps>Marketplace apps from the Admin Console. Click the more options icon next to Zoho Projects. Select Off to turn Contextual Gadgets off for everyone. Select On for some organizations to change the setting only for some users. Select the Sub Organization you want the gadgets enabled for and click Override. Toggle the On/Off switch to turn Zoho Projects on for the selected Sub Organization and click Apply. Click Turn On to activate contextual gadgets for these users. Sign-in to Google Apps and navigate to Admin Console. Click Apps and select Marketplace Apps. 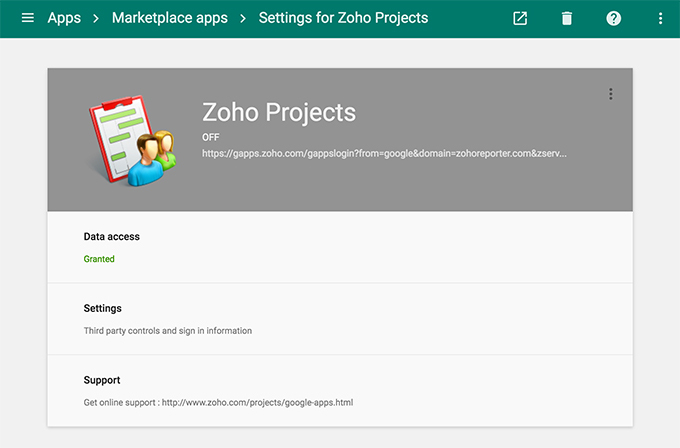 Scroll through your apps and click on Zoho Projects. 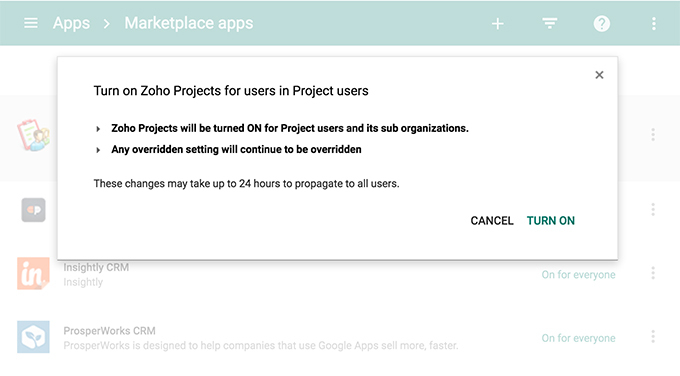 Click the delete icon to remove the Zoho Projects app.